Many authors ponder the realities of self-publishing versus the hazy dream of traditional publishing. Some choose to self-publish with the intent of presenting a polished book to an agent (which several agents prefer). Even if the design gets changed or another round of edits ensues, showcasing a professionally edited and designed book lets the agent know that you are serious about your project and don’t expect her to work with unvetted and unloved material. The route from self-published to traditionally published can look different for each author, though. Let’s look at a couple of real-life scenarios from 2017. Jenny Randle is a client and friend of mine. 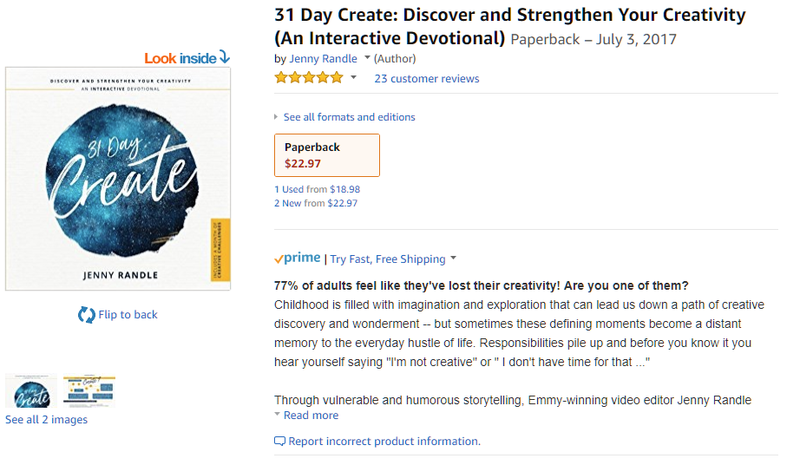 We worked very hard to bring the vision for her book “31-Day Create” to life. She invested her personal resources into self-publishing like a pro. And then guess what happened? Her book was signed to a traditional publisher just a few months after release (September 2017). Congratulations, Jenny 🙂 I don’t know if any blood happened, but I know first-hand that there were lots of tears and sweat. We had late nights and early mornings, lots of coffee and little sleep. But it was all worth it. One set of those hands belonged to a literary agent. He flipped through the book in silence … and I awkwardly fast talked my way through the dead air. At one point I even creepily yelled “OH AND I HAVE AN EMMY!” When I took a moment to actually breathe, he told me he loved the book. Less than three months after attending the conference, I signed a contract with a traditional publisher. I called my best friend and fellow author, to ask if this was normal. Turns out, it isn’t. Erin Odom has been on the blogging scene for quite some time now. She was a fellow homeschool blogger that I learned of through the homeschool blogging community. (Yep, I started out as a blogger.) Even though I decided hard-core blogging was not for me, Erin persisted. And her hard work has paid off! Her Facebook page is over half a million strong and her Pinterest has over 100K followers. Like many bloggers, she soon saw the need and the benefit of creating eBooks for her audience. Like everyone, she learned along the way about what works well, what works so-so, and what flat out just don’t work. Her hard work, well-spun words, and solid platform soon garnered the attention of the world of traditional publishing. Her first traditionally published book, “More than Just Making It: Hope for the Heart of the Financially Frustrated” was released in September of 2017. Her second book, “You Can Stay Home with Your Kids: 100 Tips, Tricks, and Ways to Make it Work on a Budget“, and its lovely cover is due to release in April 2018. From her experiences as a blogger, a self-published author, and now as a 2x traditionally-published author, Erin has written “Blogger to Author: How I Went from Hobby Blogger to Getting a Two-Book Deal with a Major Publisher“. Since I was blessed to do the Kindle conversion, I had a sneak-peek at the book before it was released. I don’t usually read the books I convert, but of course I was not going to let this one go unread. This is a unique book that gives us an inside look at the transition into the world of traditional self-publishing. These are just two examples of success from the self-publishing community. Success comes in many shapes and forms, and both of these ladies will agree that investing time and money into their own self-published works was essential in their success at snagging a traditionally-published book deal. Schedule a no-fee call with me to chat about what your goal is for your book and the investment that is required to help you achieve that goal.